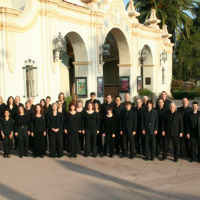 The Pasadena amateur choir is boldly offering tickets for their season opener for zero dollars. Los Angeles museums aren’t the only institutions throwing open their doors for free. Local choirs are doing it too. As economist Milton Friedman said, “The most important single central fact about a free market is that no exchange takes place unless both parties benefit.” That’s a philosophy the Pasadena Master Chorale is trying out. With the opening of its fifth season, the organization, which has been presenting critically acclaimed choral concerts since 2009, will literally put its fate in the hands of the audience. Tickets for the season opener, A Portrait of Benjamin Britten, can be bought for the sum of $0. That’s right, it’s free–if you want it to be. A Portrait of Benjamin Britten opens on October 12 at Altadena Community Church. It celebrates the 100th birthday of British composer Benjamin Britten and includes works such as Jubilate Dea, choral dances from Britten’s opera Gloriana, and hymns like Festival Te Deum and Rejoice in the Lamb, performed by the choir with the aid of organist James Walker.